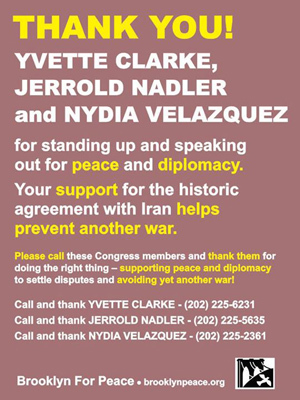 NEW YORK – In an important rebuff to the American Israel Public Affairs Committee and the forces of war, four key Brooklyn congresspeople, three of them African American and one Latina, representing large concentrations of Jewish voters, came out in support of the Iran deal. Early defense of President Obama’s diplomacy by the Congressional Black Caucus and Progressive Caucus played a role., as well as the work of House Minority Leader Nancy Pelosi’s office. But energetic organizing by grassroots peace organizations in Brooklyn also played an important part. A Washington Post poll found 59 percent support for a negotiated settlement with Iran, including a similar percentage among Jews. But it is no secret that powerful forces gathered in the Republican Party and a section of the Democratic Party, with ties to the big business media and the Pentagon, desperately want to see this deal killed. The priority of AIPAC, the lobbying group which claims to defend Israel, is to prop up the right-wing Likud party and its policies in Israel rather than to listen to any growing Jewish American majority. Taking a page from Reagan, AIPAC, along with its supporters in Washington, terms Iran an “evil empire” and any negotiation as “appeasement.” As noted by President Obama and others, behind them stand many of the same forces who beat the drums of war around Iraq. For some Iran deal opponents, the issue is purely partisan. Republicans want President Obama to fail, and to oppose anything he supports. For many of the Republican presidential candidates, military intervention leading to regime change remains the first choice towards Iran. Their anti-treaty strategy has been clear: to sway enough Democrats in order to overturn a promised presidential veto in the event of a first round voting-down of the deal. Particularly targeted in their campaign are those congresspeople representing large concentrations of Jewish voters in urban districts. An AIPAC promise of heavy campaign funding in the next election is implied if they oppose the deal. The threat of funding candidates to run against them is implied if they don’t. As documented by the New York Times, AIPAC is spending up to $40 million in its effort to defeat the deal, including major TV ads, and sponsorship of trips for 58 congresspeople (36 Republicans, 22 Democrats) to Israel. Although they were able to win New York Senator Charles Schumer and New Jersey Senator Robert Menendez, both Democrats, to their side by early August (a giant AIPAC-funded billboard in the midst of Times Square currently thanks Schumer for his position), their broader target was the entire New York delegation, most of whom by mid-August had not yet announced their decision. A national day of action on August 26, initiated by MoveOn, focused on meetings with congresspeople who were still on the fence. The grassroots group Brooklyn For Peace played a particularly important role in mobilizing on short notice over 200 constituents to meet with undecided Democratic Reps. Hakeem Jeffries, Yvette Clarke, and Nydia Velasquez. At coordinated pro-deal rallies outside the congressional offices, demonstrators carried “Defend Diplomacy” placards, chanting “Hey, Yvette, Support the Deal, That Is What The People Feel!” As if to illustrate this, BFP organizer Matt Weinstein later handed Rep. Clarke 1,629 petition signatures gathered from her constituents in the 9th Congressional District. As pedestrians passed by on Linden Boulevard, street speeches for “Jobs, Not War” rang out, loud and clear. “Honk for peace” signs inspired many honks by passing motorists, both black and white. These signatures had been gathered at street tables, town meetings, house meetings and farmers markets in central Brooklyn throughout the hot days of August. Petitioners wore MoveOn T-shirts that read “60 Days To Stop A War,” and leaflets were distributed warning of the harmful consequences if there was a “no” vote. A protest demonstration at Schumer’s office on Aug. 10 featured several hundred members of MoveOn, Jewish Voice for Peace, Peace Action and Brooklyn for Peace, among others, in a show of unity. The media coverage this received was a much needed counterpoint to AIPAC’S big money blitz. Before this, the prevailing wisdom among elected officials in Brooklyn, even among the most liberal, is that you challenge the power of the AIPAC Israel lobby only at the risk of your own re-election. But if the developments here are any indication, that is changing. as the result of past U.S. unilateral military actions like Iraq, and the growing economic crisis at home. Growing disillusionment among many Jewish voters with the AIPAC lobby, which claims to defend Israel, but speaks only the language of money and special interest, is also playing a part. A vote is expected on the Iran agreement in Congress on Sept. 17. It is increasingly likely the agreement will have enough backing to overcome efforts to block it. But activists say letters of support and thank you are still needed to lawmakers who have said they will support the agreement, to keep them from being swayed back the other way. 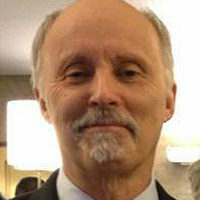 Chris Butters is a retired NYC court reporter, and a former DC 37 (AFSCME) chapter officer. Chris is a co-producer of WBAI-FM (Pacifica)'s Arts Express radio show. He has published two books and four chapbooks. His poetry has appeared in Blue Collar Review, and many other literary and left poetry magazines.